You know you can do this, right? Now spread those wings and show 'em what ya got! Go easy on me, it's my first time building a website. I decided to make one for my self earlier this year (2016) after winning my first design awards to try and get my self out there more doing what I love. Poster design and digital art. I never really liked being in the spotlight so I let it hold me back for way too long. Winning two honourable mentions at the the 2016 Muse Creative Awards was a pretty amazing experience and a bit of a wake up call telling me I could be doing so much with my designs. So here I am, people of the internet! Ready to spread my wings and take flight! 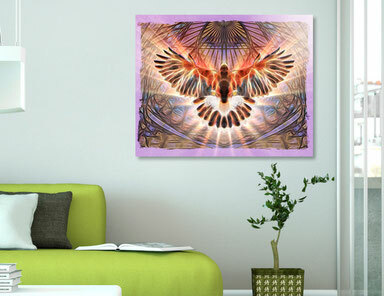 "Hawk Rising" in situation as an acrylic glass print. Check it out on my wall art shop!